Discovered by Wallace in 1891, this species was named for Formosa, now Taiwan. Native primarily to the northern part of the island. Best grown in a cool greenhouse. If garden planted, it should be in a warm, site sheltered from the elements. Very short lived, but will flower in 18 months from seed. Very prone to virus infections so should be kept separate from hybrid lilies. Grows to 4 to 5 Feet. Ed McRae in this book 'Lilies, A Guide For Growers And Collectors' reports that it was crossed in the past with 'L. 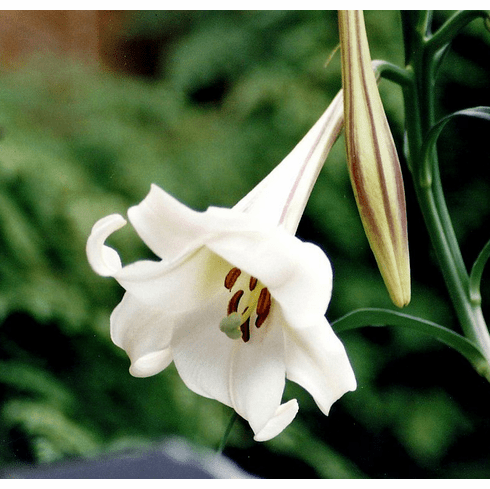 longiflorum' (Easter Lilies) to produce 'Formolongi, and with 'L. nepalense' resulting in 'Formolense'.